That was pretty much my start of cooking seriously for myself, though in this context “serious” meant a lot of chicken breasts with steamed broccoli interspersed with granola or Special K bars for dinner. (The Special K bar dinner was the saddest.) I also discovered how very lonely it can be to sit and eat dinner in silence by yourself every single night. I suppose that must have contributed to my passion for sharing meals, and I started devising ways to coax others to dine with me. The dinner party was the big opportunity. It was the night of some winter dance whose name I can no longer remember, and I invited a dozen friends to come to a sit down dinner in the “fancy” lounge area of the neighboring dorm building where we set up a line of tables and chairs. I borrowed dishes left and right and even made small centerpieces. The dinner itself was 7 courses, and – here was the real selling point for this as a pre-party in my friends’ minds – there was a different wine for each course (bought by my boyfriend at the time who was enough older than me to be able to buy wine for us all – tsk tsk!). I even bought wine glasses that were just over a dollar apiece so I could serve the wine with class. I still remember each of the courses because I was first frantically preparing them all day in the tiny dorm kitchen I used, then transporting them to the other building one run at a time, then trying to finish them and keep them warm and plate them for everyone at the proper intervals while also sitting down for each course to eat (um, and drink. My knife skills went downhill over the course of the evening. Don’t try this at home.) with everyone else. You don’t forget a college project like that. There was spanakopita and cheap prosecco to kick things off, then this soup, a simple green salad, a fish course of sole (oooh, so fancy) with a warm tomato and olive salsa, then chicken with a creamy mushroom sauce and roasted broccoli (a slightly dolled up version of my staple supper), and after all that, a flourless chocolate cake for dessert. Not bad for a 19 year old, right? If you must know, the fish was overdone, the broccoli had gotten completely mushy and overcooked in the time it had to wait for the chicken to be ready, and I totally served a raspberry sauce with the chocolate cake (which, I’ll have you know, was less cringeworthy back then), but still, I feel like it was a pretty good showing for a first dinner party. I have no idea if anyone else who was there even remembers it anymore (there was a lot of wine, after all), but I know I still recall it fondly, and having people over for dinner is still one of my all time favorite ways to pass a lovely afternoon or evening (or morning for that matter, since brunch parties are awesome). Ok, now after all that, the soup! 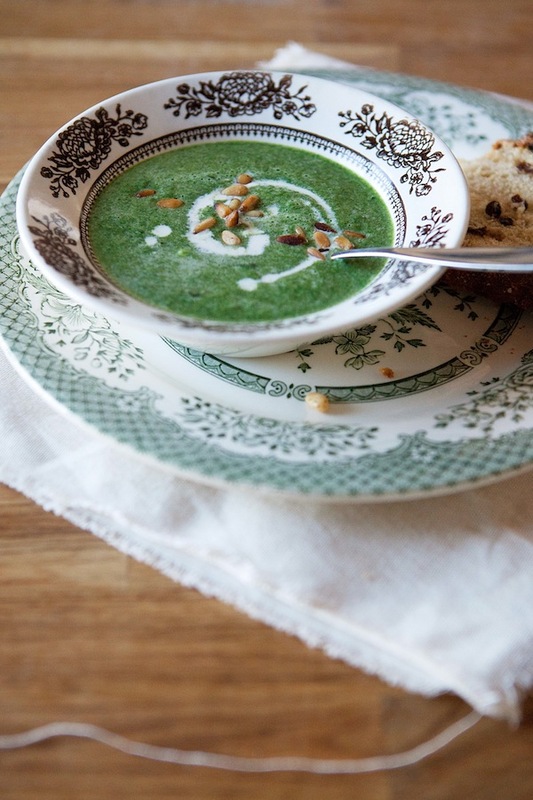 This soup is a creamy, but not at all heavy, blend of tons of spinach with a generous amount of toasted pine nuts, which make a double appearance both chopped in the soup and sprinkled on top. 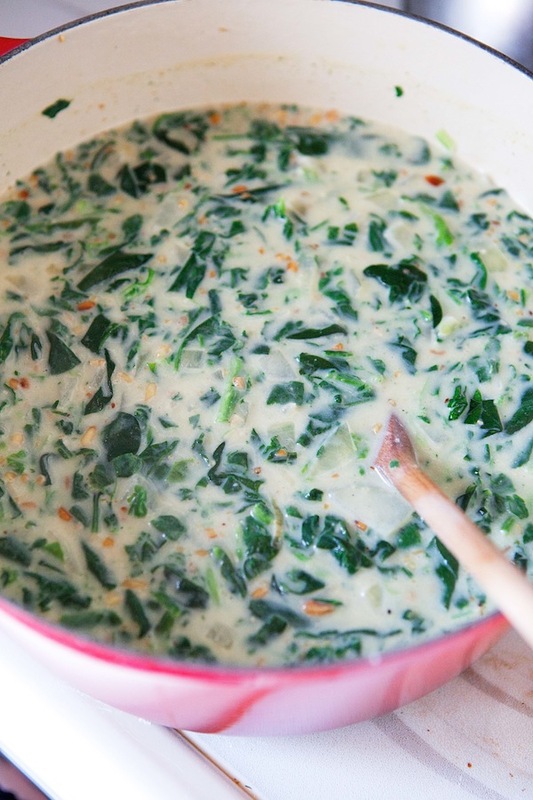 The spinach is slippery and silky, made sweet by cooking with milk, and spunky by a sprinkling of nutmeg. The richness of the pine nuts provides a wonderful counterpoint to the more austere flavor of the spinach, and they work beautifully together. I like to blend about half of the soup and leave half of it chunky so that you get satisfying bites of spinach and onion mixed in with the smoothness. I finish the soup with a swirl of creme fraiche, giving it a little extra tang. Creme fraiche is fabulous in general with spinach and nutmeg, and this is no exception. After all these years, I still think this one is a keeper. 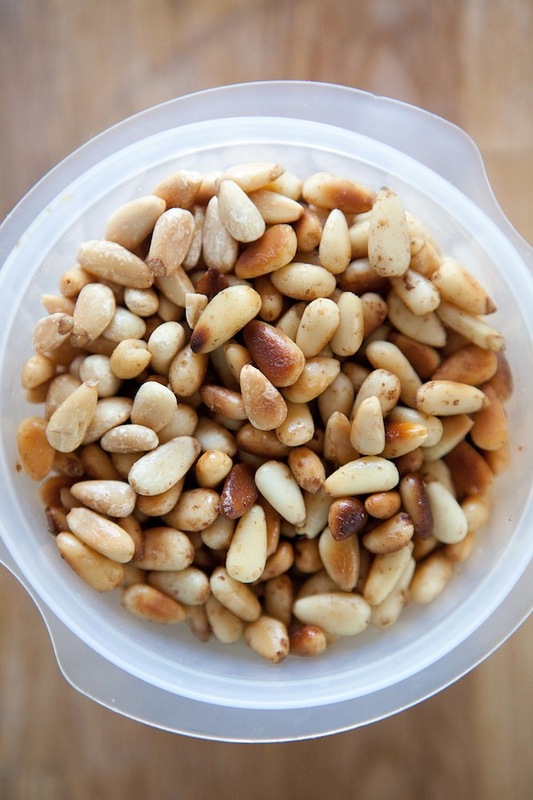 In a large heavy-bottomed pot, toast the pine nuts over medium heat, stirring frequently, until they are golden and browned in spots. Remove them from the pot. 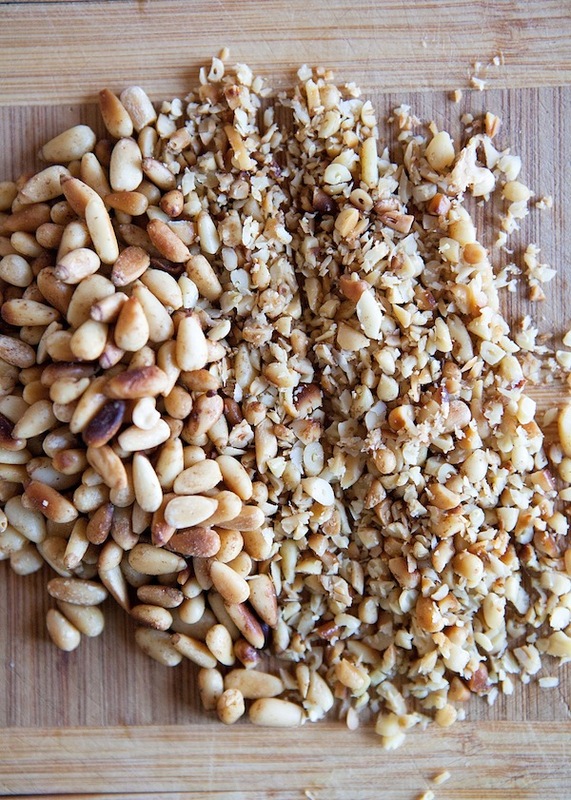 Finely chop just under 1/2 cup of the pine nuts, and put the rest in a small bowl to reserve for garnish. Place the pot back on the stove, turn the heat to medium-high, and add the butter. When the butter is foaming, add the onion. 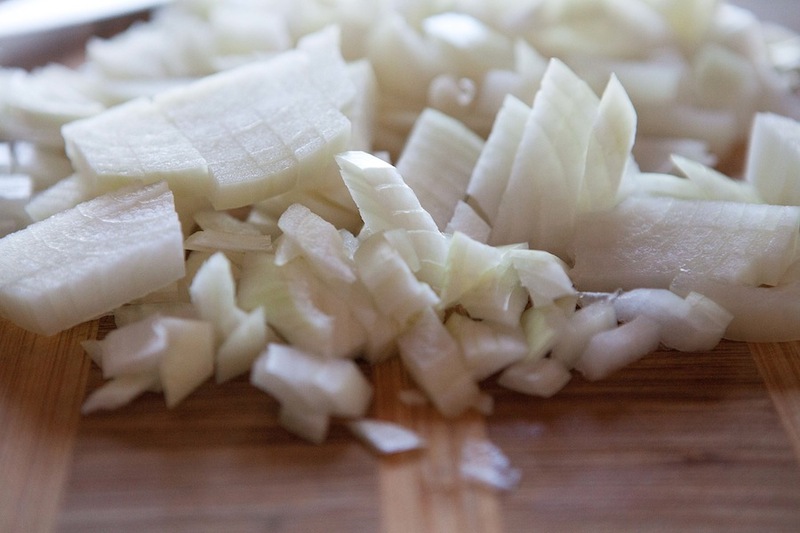 Cook, stirring, until the onion is softened, about 5 minutes. Add the spinach, and cook for a few minutes, until it has wilted. Stir in the chopped pine nuts, nutmeg, salt, and flour/potato starch, stirring well to get the vegetables evenly coated. Cook for one minute, then slowly stir in the stock. Stir well to make sure all of the starch is dissolved into the stock. The mixture should seem pretty thick. Bring to a boil, then turn down to a simmer. Add the milk, stir, cover the pot, and cook until the milk comes to a bare simmer. Transfer the soup in batches to a blender and blend each batch very well until smooth (this should take about a minute, or just slightly less, per batch). I blend half of the soup and leave half chunky but you can blend it all if you prefer. Stir the blended soup back into the pot. Taste and adjust salt and pepper to taste. Rewarm slightly if it needs it. Just before serving, stir in the creme fraiche/sour cream until it is blended in, or you can pass it around in a bowl and let everyone stir a spoonful into their own bowl. Pass the reserved pine nuts around the table so everyone can sprinkle a few on top of their soup. 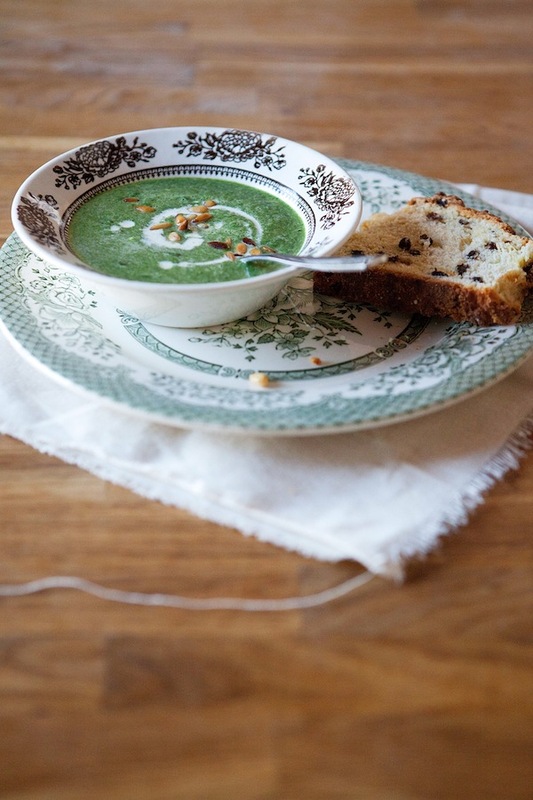 This soup makes a nice starter for a meal, or if you happen to serve it with fresh soda bread and some good sharp Cheddar (or other cheese), you’ll have yourself a beautiful meal right there. I bet this soup is delish. Especially with the fresh grated nutmeg. I will have to make this one. Oh this looks lovely. Another one to try! Mostly i wanted to see if my gravatar works, but also to say that i’d already planned the mozarella with polenta for today and now i have to go pick up spinach to make this soup. Getting your email is the best part of the week. Your gravatar works! And thank you SO much. That’s so sweet of you! When you’re the first one to ‘grow up’ or realize that cooking for and eating with other people is one of the most enjoyable experiences EVER, it often means it’s at the expense of always having other people come and eat something you’ve slaved over, paid for, concocted for their (and your own) pleasure and mostly it doesn’t get repaid often enough or ever in some cases! But it is all so worth it. Too true. But also absolutely true that it’s 100% worth it. A warm basil spinach salad with prosciutto and pine nuts is one of my favorite salads, so I know this soup will be great! Mmm, that salad sounds wonderful. This soup looks wonderful. College was also a time of culinary exploration for me. Thanks for sharing your memories and this delightful recipe! 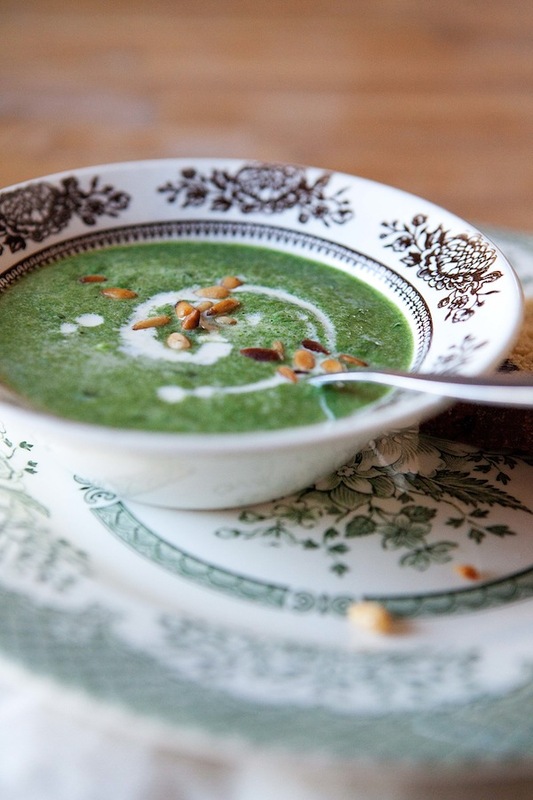 I always think of pesto when I think of spinach and pine nuts, but this soup sounds delicious. And as always, your photos are beautiful. Thank you Melissa! It’s fun to take pine nuts out of the pesto box. looks great for Passover. thanks! Especially if you use a dairy substitute. 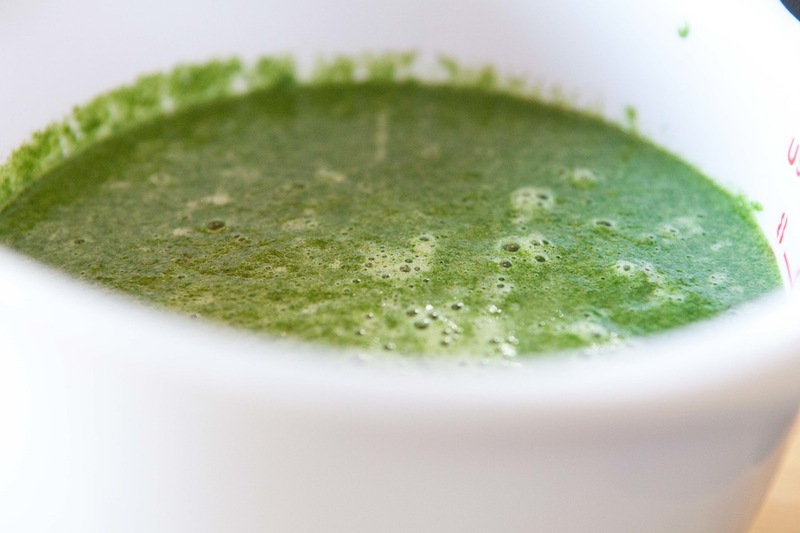 You are currently reading Spinach and pine nut soup at Five And Spice.